As 2012 marks the 200th anniversary of Charles Dickens’ birth, we will be reading Dickens’ BLEAK HOUSE, commonly considered his best work. 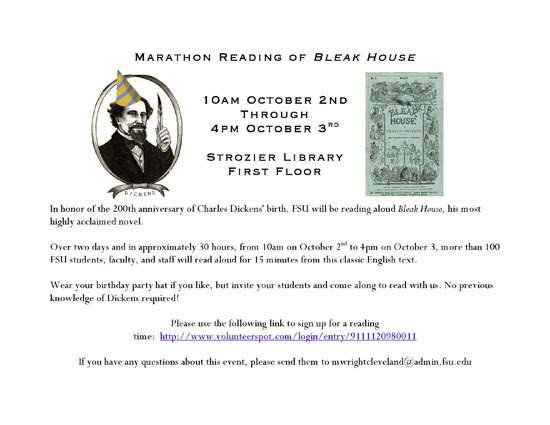 At 10:00 a.m. Tuesday, October 2 in Strozier Library, we will begin reading BLEAK HOUSE aloud and we will continue until we have read the entire book. I expect this to take approximately 30 hours, so we will need 120 readers. We are asking readers to commit to 15 minutes. Each reader will simply pick up where the last one finished. We will have copies of the text available. This reading is meant to be fun and attract readers of all sorts to spontaneously join in. It is a celebration of language and story-telling and all that makes us human. http://www.volunteerspot.com/login/entry/9111120980011. It requires your name and email to log in so that you may be sent a reminder. Signing up in this way will NOT put you on any other email list. Of course, drop in readers are always welcome.